The Vancouver International Film Festival has announced the debut of the Rob Stewart Eco Warrior Award. The annual award will recognize an individual whose work as an activist and storyteller advances social impact agendas and changes the way we think and act in the world. Rob Stewart was an award-winning filmmaker and beloved conservationist, known for his films Sharkwater (2007), Revolution (2013) and the upcoming Sharkwater Extinction (2018), which brought the devastating issues of shark finning and ocean conservation to the world stage. In fact, following the release of Sharkwater, many countries put bans on shark fins in place. However, Rob found his work wasn’t done when he discovered sharks were being hidden in many products sold to the public, such as cosmetics, pet food and even our food, which is what he was working on exposing while shooting Sharkwater Extinction. In January 2017, while getting footage of rare sharks for the film, Rob tragically passed away during a dive off the Florida Keys. The world was stunned by the loss of one of the most influential activists of our time. Rob risked everything in a tireless effort to educate, preserve and defend the oceans. 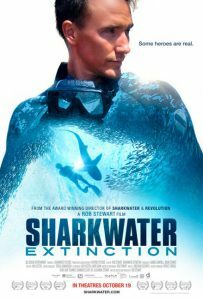 Sharkwater Extinction will debut in theatres across Canada on October 19, 2018.